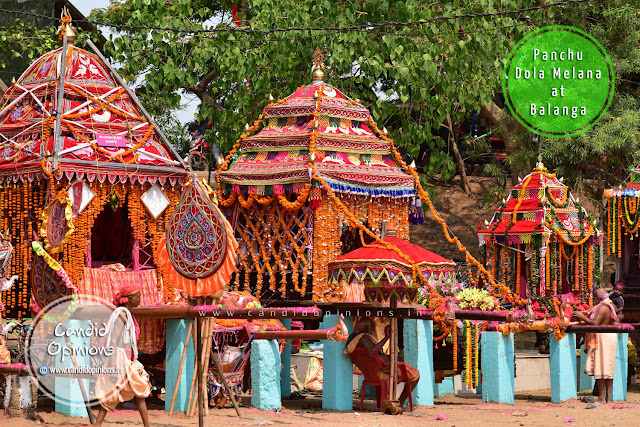 Dola Jatra or Dola Utsav is a very popular social festival in Odisha and is celebrated with much enthusiasm and gaiety across the state, especially in the villages. 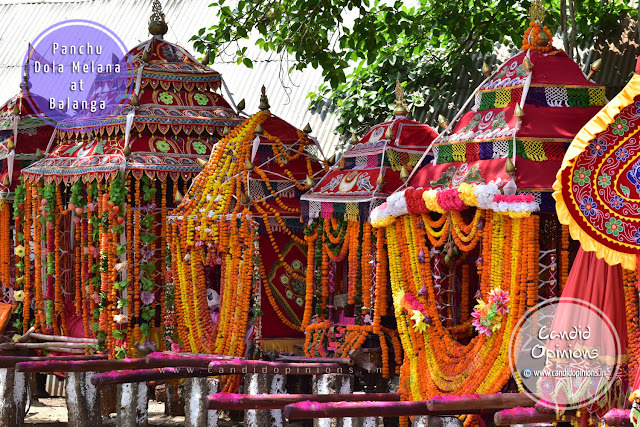 The five day festival offers one a unique experience and showcases the state’s age-old traditions and vivid culture. Apart from the Dola Jatras of the individual villages (in which the deities are taken around the village for "Chachery bhoga"), another major attraction of this Utsav is the Panchu Dola Melana (or the congregation of the various deities from the neighbouring villages, carried in beautifully decorated palanquins, at one place). This year since I was in Bhubaneswar, I decided to visit Balanga, a village located near Puri, to witness the Panchu Dola Melana there. More so because the deities from my village Biswalpada too participate in the Balanga Melana. 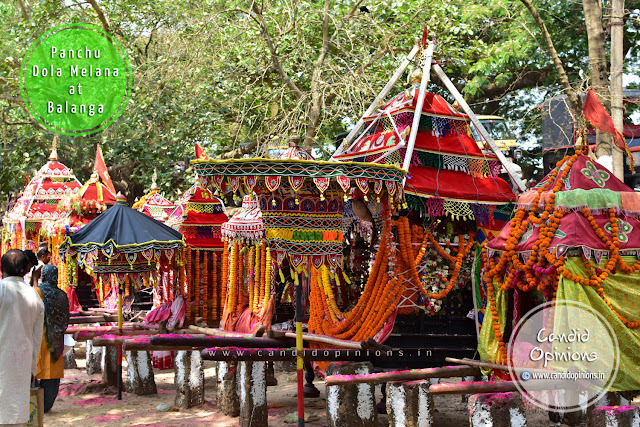 (You may also want to read my other article about the history and significance of Dola Jatra in Odisha here). Truth be told, I had never seen Panchu Dola Melana celebrations ever before and so I was really excited about visiting Balanga. Reaching the place is not that difficult, one can easily hire a car or else like I did, take the AC Bus heading towards Puri from the Bhubaneswar Master Canteen bus stand and get off at Saata Sankha Square along the National Highway. 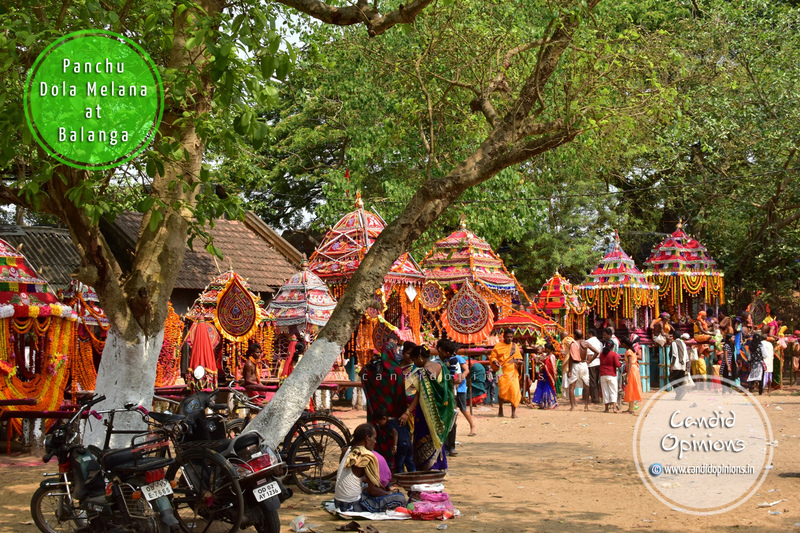 From there, one can easily find a shared auto-rickshaw (costing merely ten rupees) to reach the Balanga Melana Padia. The Dola Melana celebrations at Balanga, though not as grand and flamboyant as the one organised at Harirajpur village on the Jatni-Pipli road, but nonetheless witnesses quite a significant footfall of devotees. In fact, every year close to a hundred and twenty palanquins carrying the "Chalanti Pratima" (or representative movable idols) of the deities from the neighbouring villages gather at the Balanga Melana padia and the celebrations continue for two days. This year though, the number had reduced to eighty seven "Vimanas". 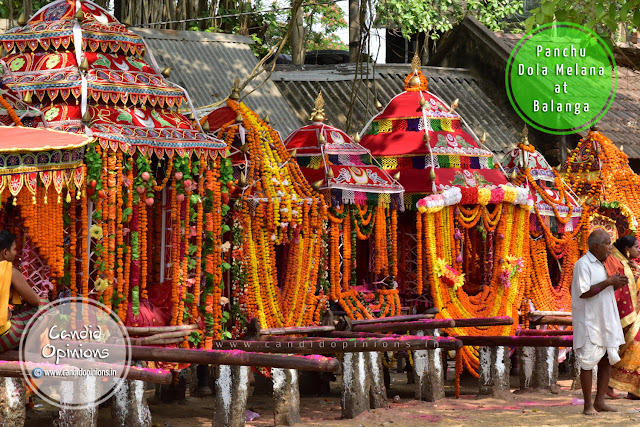 Every year, as per the custom, invitation is first sent from the presiding deity of village Balanga to the deities of the neighbouring villages and then on the Panchami tithi after the full moon night (Dola Purnima), they all assemble at the melana padia (the congregation ground). The various deities from the neighbouring villages come in a procession one by one, led by their drummers, pipers and sankirtan mandalis, amidst blowing of conch-shells and chants of "Hari Bol". It was an amazing experience to see so many palanquins (or "Vimanas") - covered by artistically handcrafted "Dola Mandanis" replete with exquisite Pipili applique works and so also beautifully decorated with flowers and lightings - placed in a row along the periphery of the melana padia. 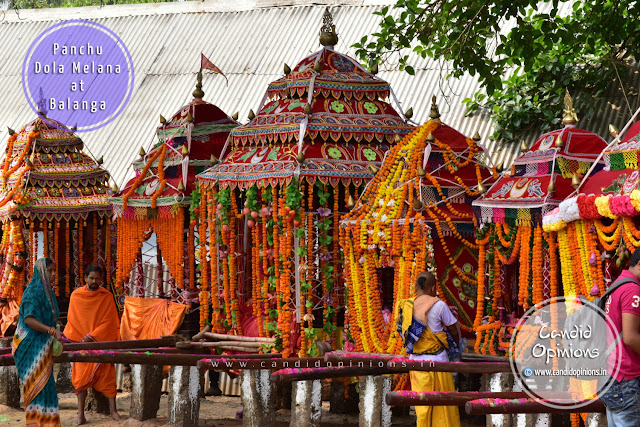 There were hundreds of devotees there, who had come from near and far-off places to pay obeisance to the various deities, visiting each Vimana one after another and offered lighted lamps, dry prasad, flowers and abhira (or dry colours). 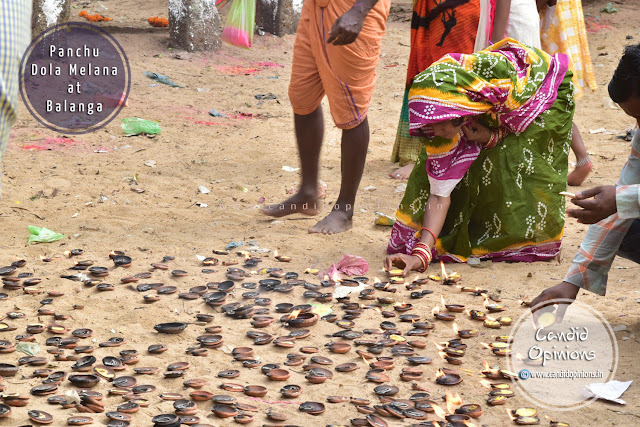 It was really heartening to see that despite modernity slowly creeping into our lives, we haven't abandoned our age-old cultural traditions, at least not in the villages. Now it's up to us - the current generation to keep them afloat and not let them go into extinction. As always, amazing write up. Keep writing. BTW, 87 Dolas from as many villages? Sorry to say this but I had no idea about Balanga Melana before this. I had been to Hari Rajpur Melana a couple of years back and yes, it is done on a much bigger scale with melody nights and lighting arrangements etc. 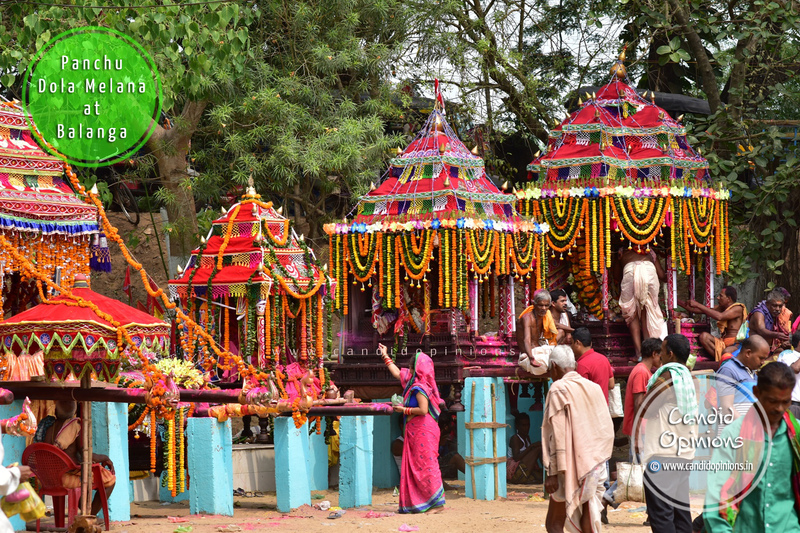 But there is something more beautiful about a village celebration - a kind of simplicity and sincerity with no pretentious displays, that strikes a chord.